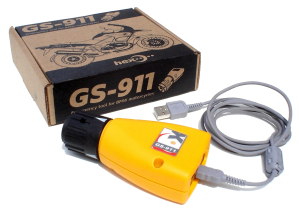 The GS-911, developed by HEX, is a new generation diagnostic tool for BMW motorcycles. What can the GS-911 do? 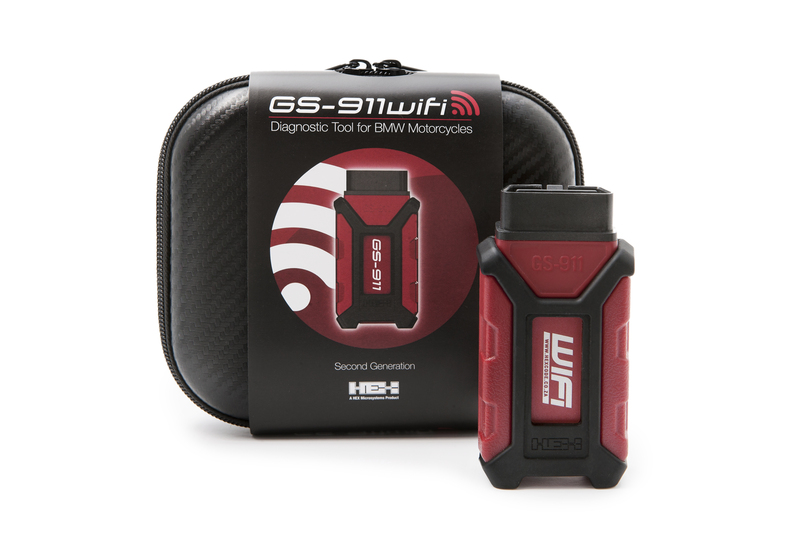 The GS-911wifi is designed for BMW motorcycles featuring 10-pin diagnostic ports. It is compatible with the latest generation of K001 chassis BMW motorcycles (K1600GT/GLT, R1200GS LC, R1200GS Adv ALC, R1200RT LC, S1000R etc.). This product is also backward compatible and supports ALL the previous models of BMW motorcycles that have round 10-pin diagnostic connectors. D2D (device-to-device) and HEX Cloud enabled, this model is also available in both Enthusiast and Professional license options. This product is available through our distributors (see our reseller page), or directly from our online shop. Connecting the GS-911 to a new EU-4 compliant BMW motorcycle without an adaptor cable is now possible. This GS-911wifi features a J1962 (OBD-II) connector. 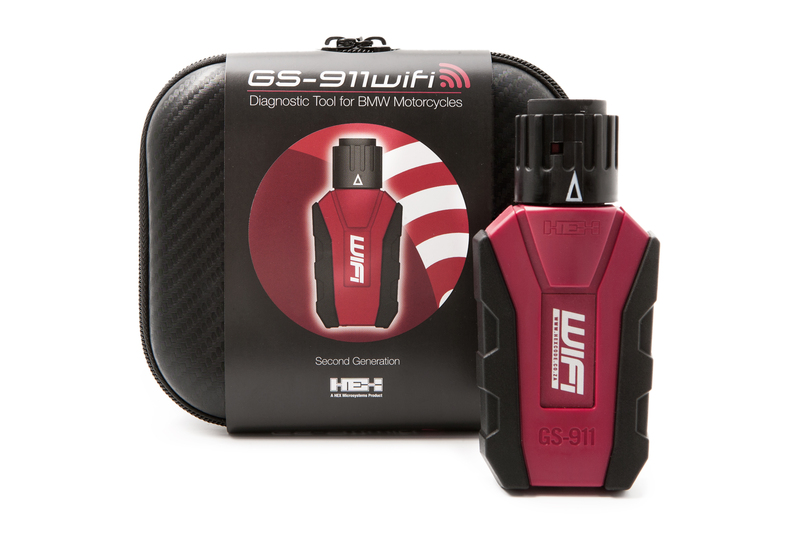 This GS-911wifi model is compatible with all newer EU-4 compliant BMW motorcycles with OBD-II connector ports. In addition, when used in conjunction with the female OBD-II adaptor cable this product is also backward compatible and supports ALL the previous models of BMW motorcycles that have round 10-pin diagnostic connectors. D2D (device-to-device) and HEX Cloud enabled, this model is also available in both Enthusiast and Professional license options. A new generation GS-911usb device offering the ultimate value to BMW Motorrad enthusiasts. This GS-911usb model features a J1962 (OBD-II) connector and is compatible with all newer EU-4 compliant BMW motorcycles with OBD-II connector ports. In addition, when used in conjunction with the female OBD-II adaptor cable this product is also backward compatible and supports ALL the previous models of BMW motorcycles that have round 10-pin diagnostic connectors. This cost-effective solution is used exclusively in combination with our Windows PC application via a USB cable. The GS-911usb is available in an Enthusiast license option only and is not upgradeable to a Professional license. Please refer to our product brochure for further information. The GS-911 models come with either 10-pin or OBD-II connectors. This development was driven by the new OBD-II diagnostic connectors featured on the newer EU-4 compliant BMW Motorrad models. 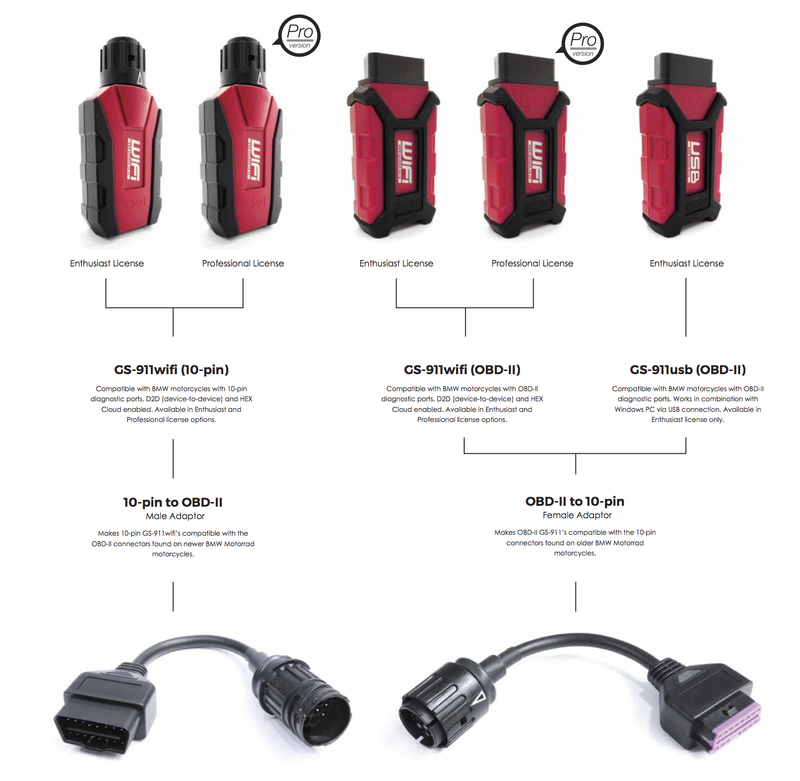 However, if you need to use your 10-pin GS-911 on a motorcycle with an OBD-II connector, or vice versa, we offer adaptor cables which allow you to do just that. 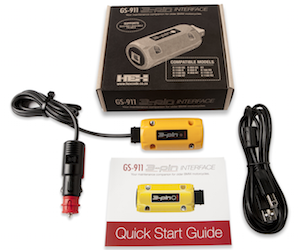 GS-911 3-Pin Interface, designed by HEX Code, has support for USB connectivity and is compatible with Windows™. It is a complete stand alone GS-911 diagnostic tool (no other GS-911 device required) and is designed exclusively for the older models which have a flat three pin diagnostic connector. Applicable for Bosch Motronic versions MA2.1, MA2.2 as well as the ABS II controller. Please see the Function Chart. NOTE: This device replaces the previous 3-pin adapter. GS-911blu & GS-911usb, designed by HEX Code, are a unique software and hardware combination that allows the BMW motorcycle enthusiast the ability to communicate with the control modules in a safe and controlled manner. GS-911usb- with USB only, for Windows.